Last day. Preposterous crowds. The trick is to skip around until you spot a picture not being looked at. The problem with this approach is that although it is a big show there aren't that many paintings, on account of their being so damn large. However, you'd have to be deeply misanthropic not to enjoy being surrounded by this stuff, even in the press of head-phoned humanity. 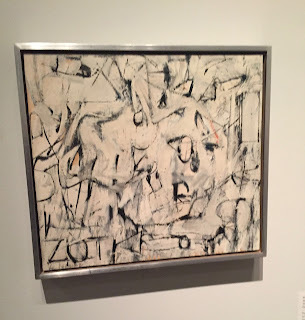 So - a few notes: Willem de Kooning was a bit of a turn up. Although I don't much like his pastellly palate, I do like the kind of tease in his pictures: what precisely am I looking at? 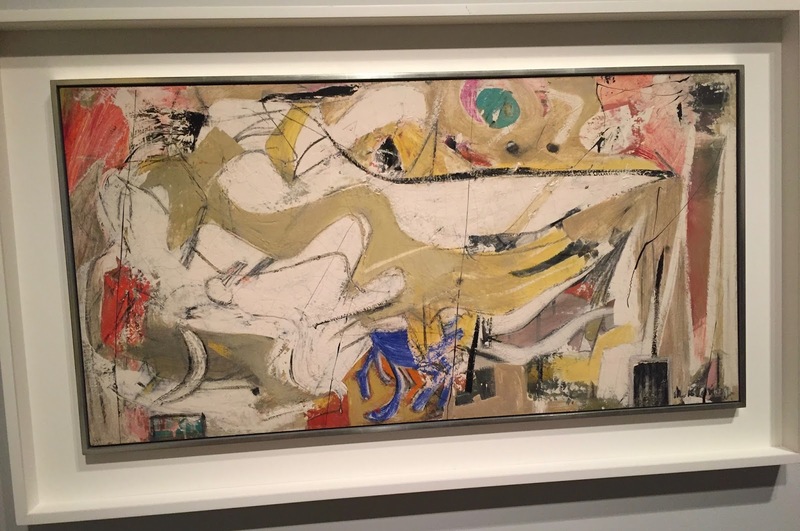 (There is that odd moment in art history - brought home in the recent Nash exhibition - when Surrealism and Abstract Expressionism shared a similar space; there's a Rothko gouache and w/c here from 1944 that occupies the same place). I enjoyed a Motherwell or two, especially the big 'Elegy to the Spanish Republic' (unspoiled by a son's insistence that it was an illustration of Imperial fighters from Star Wars). The Rothko room is too full of people - It is hard to get that weird otherworldly hum that Rothko's paintings give off in a room of his paintings, as though speaking to one another. He and Pollock - yin and yan, energy and meditation - so perfectly complement one another, and they are head and shoulders, in my opinion, above the rest. I think 'Blue Poles' alone was worth the price of entry. An absolutely fabulous thing. In reproduction it is almost impossible to understand the sheer scale, and the work, the ferocity of it; it has depth but it also sits on the surface. It can be looked at in so many ways. Might be worth a trip to Australia to see it again. A real privilege. Finally, a word about David Smith, whose sculptures make you smile, seasoning the austere seriousness of the painters' ambitions. 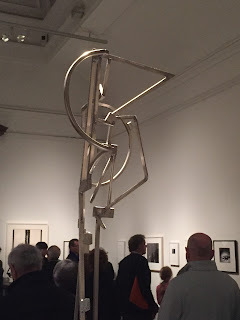 I saw a show of his at the Tate Modern a few years ago, and because he is not a galactico, it was possible to actually see each piece in relative peace and quiet. They are invariably engaging - again on that nexus which includes surreal and abstract - and often beautiful. Fab show. Catalogue sold out. Here are a couple of badly photographed de Koonings and a David Smith.